Last summer, the Massachusetts Office of Travel and Tourism came out with “The 1,000 Best Places to Visit” list and the Breakneck Hill Conservation Land was the lone entry for Southborough. Located on Breakneck Hill Road across from Breakneck Hill Farm, this lush landscape is a popular destination in the spring and summer. 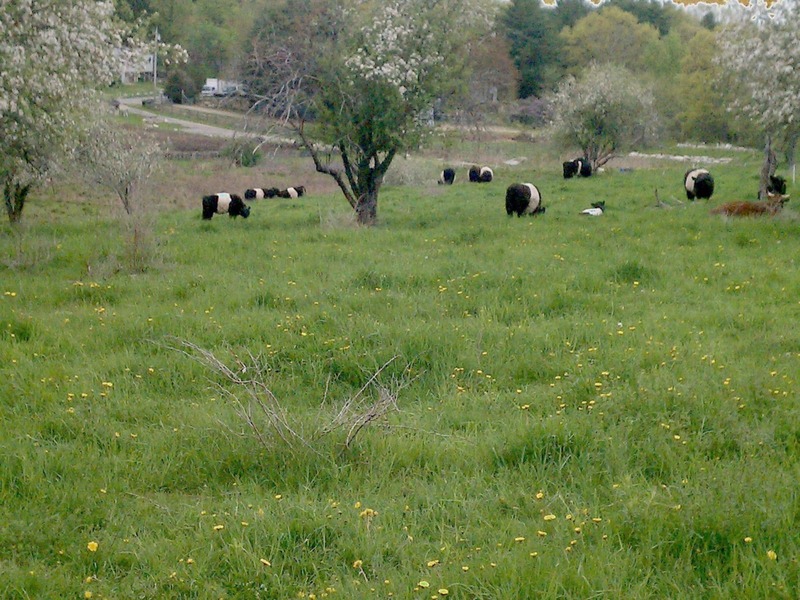 The reservation has trails for hikers and bird watchers, but the signature attraction is the Belted Galloway cattle, or “Belties,” grazing on the hills of the conservation land. This extremely rare breed of cow is often referred to as “Oreo Cookie” cows, with a broad white stripe that completely encompasses the middle of their bodies. These animals are unique and unlike the run-of-the-mill cows found at most local farms. Southborough was recognized as a farming and agricultural community throughout most of its history, and Breakneck Hill gives visitors a peek into the town's past as a rural community. The Breakneck Hill Cow Fund also holds annual events such as a “Cow Pie” contest and a family nature walk to raise funds to preserve these animals. Driving along Main Street in downtown Southborough feels historic. Drivers pass a World War 1 Howitzer and monuments honoring those who served the country. Notable buildings such as Town Hall and the quaint Pilgrim Church are perched atop a hill overlooking Main Street, the war monuments, the Fay School – the nation's oldest junior boarding school, and St. Mark's School. Classic 18th-century homes that line the street are beautifully maintained and accentuate Southborough's historic feel. The business district manages to retain its charm by restoring original buildings, including a former firehouse that is now a pizza shop. Southborough often preserves historic structures and open spaces, and Chestnut Hill Farm is no exception. Located on Chestnut Hill Road off Main Street, Chestnut Hill Farm is managed by the Trustees of the Reservations, which manages over 100 properties and more than 25,000 acres of open space in Massachusetts. In 2006, the people of Southborough voted overwhelmingly to purchase unprotected areas of Chestnut Hill Farm for public use. There are two miles of trails for walkers and hikers across a variety of terrain in the open landscape. Tall grass and fields of hay line the neatly manicured cart path that leads into a wooded area dominated by pine and oak trees. The path leads to the covered embankment of the Hultman Aqueduct, a backup water supply for the Quabbin and Wachusett reservoirs. Due to the fact that it is a working farm, large tractors and equipment occupy the property and create a picturesque rural landscape. It's a great place to let kids run or to watch the sunrise in a bucolic setting. Leave the dogs at home however, as they are not permitted on the reservation. The Sudbury Reservoir covers seven towns, almost 5,000 acres of land, and nearly 25 percent of Southborough's land area. The best place to access this huge network of nature trails is on Acre Bridge Road off Route 30. There is a parking area next to 9/11 Field. Due to the fact that it is a public water supply, many activities such as swimming, dog walking, boating, and ice-skating are prohibited. The area does allow hiking and cross-country skiing along its neatly maintained wooded trails, and fishing along its shorelines. There are also ample opportunities to view various species of wildlife and birds. Frequent sightings of geese, ducks and herons keep birdwatchers coming back. Possibly the most picturesque setting along these peaceful waters is on Route 30 as it splits the reservoir. This location provides a beautiful backdrop in the morning as the sunrise, trees and sky reflect off the clear, still water. On early fall mornings, mist and fog can be seen hovering above the glass-like surface of the water. Dedicated in 2005, 9/11 Field is a beautiful new artificial turf field for soccer, lacrosse and other recreational activities located within the Sudbury Reservoir. Most significant however, are the plaques honoring those from Massachusetts who lost their lives that day.